Greetings again from the darkness. Totally unexpected is a documentary on big game hunting that doesn’t come down squarely on one side of this argument. Co-directors Christina Clusiau and Shaul Schwarz do an admirable job of laying out the facts and leaving the viewer to contemplate how these moving pieces create a blurred line between conservation and commerce. Expect a couple of scenes that might be difficult to watch – after all, it is a documentary on hunting animals. There are plenty of facts and statistics provided, with one of the most staggering being since 1970, the world has lost 60% of its wild animals. 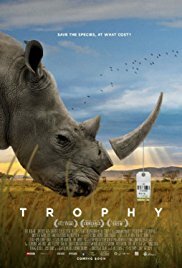 Rhinos alone are down from 500,000 to 30,000, and we meet a rhino breeder who has devoted his life and fortune to saving the species. On the surface, his stance seems difficult to debate, but African law prevents the sale of rhino horn, which means this breeder is sitting on millions of dollars of warehoused horns, while poachers profit by picking off his animals and selling the horns on the black market. Not so clear now, is it? Additional segments involve elephants, alligators, and other species. We visit the massive Safari Club hunting convention in Las Vegas, as well as stock auctions where breeders battle over the next generation. The safari clubs argue that much of the money paid by big game hunters is distributed back into the conservation efforts of the country, though the corruption of politicians can’t be ignored. The contrast between shooters and hunters, killers and sportsmen, is noted and legitimate detailed information is provided. Focus goes to the “Big 5”: hunters trying to bag each of water buffalo, leopard, elephant, lion and rhino. The process is slow and expensive, and the three affected tentacles – hunting, breeding, conservation – have evolved to facilitate the future of the species and those dependent on the industries. Hunter’s remorse is admitted, as is a connection to the animals by the otherwise stoic and businesslike breeders. When one hunter quotes the bible in saying that man shall have dominion over animals, it’s a reminder that no matter one’s stance on these topics, there is always an argument to be had and a defense to be made. The still unanswered question is, can the industry be run in a manner that allows the animals to survive, the villagers to benefit, and the vendors to profit? In theory, this seems doable … but reality and self-interest often destroy best intentions. This entry was posted on Thursday, September 28th, 2017 at 6:54 pm and is filed under Documentary. You can follow any responses to this entry through the RSS 2.0 feed. You can leave a response, or trackback from your own site.